Patient with a rhegmatogenous retinal detachment secondary to a single horseshoe tear prior to pneumatic retinopexy. 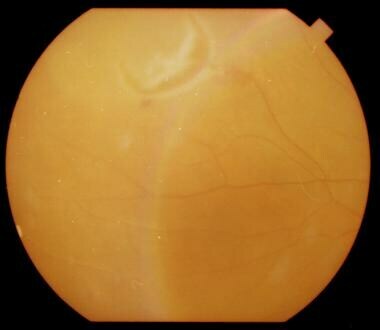 Patient with a rhegmatogenous retinal detachment secondary to a single horseshoe tear 24 hours after pneumatic retinopexy; the retina is completely attached. Notice the intraocular gas bubble. The main advantage of pneumatic retinopexy over scleral buckling is the minimization of complications such as inadvertent scleral perforation by scleral sutures, postoperative refractive error changes, strabismus, and potential complications associated with the drainage of subretinal fluid. The initial success rate of pneumatic retinopexy is lower than that of scleral buckling, but the final anatomic and functional results are comparable. The lower initial success rate is due to a higher frequency of new retinal breaks and missed retinal breaks. Not all patients with a rhegmatogenous retinal detachment are good candidates for pneumatic retinopexy (PR). Case selection is the most important determinant of success. In general, the best candidates for pneumatic retinopexy are those who have a single retinal break or group of retinal breaks that are not larger than 1 clock hour (30°) and that are located in the superior 8 clock hours of the globe. 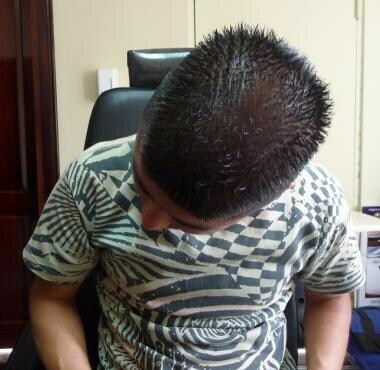 Furthermore, the patient must have the ability to maintain a proper head position for at least 16 hours per day for 5 days or more. For an average eye, 0.3 mL of gas covers 90° of the retinal surface in an emmetropic eye. In contrast, 1.6 mL of intraocular gas is necessary to cover 150° of the retinal surface. [4, 5] Thus, even after full expansion of a 0.3-mL bubble of pure perfluoropropane (C3 F8) to 1.2 mL, the inferior retina will not be covered by the gas bubble unless the patient assumes an extreme head position. Most patients cannot tolerate the 90° neck flexion or hyperextension position required for proper gas tamponade of retinal breaks in the inferior quadrants. [4, 17] Even though some reports showed the successful repair of selected cases of retinal detachments along the inferior 4 clock hours (4 to 8 o’clock),  pneumatic retinopexy (PR) usually fails to repair such detachments. Most patients undergo pneumatic retinopexy under subconjunctival anesthesia supplemented by topical drops. When cryotherapy is being considered, retrobulbar anesthesia allows comfortable scleral depression, permits cryotherapy to any quadrant, and prevents a vagal response that may occur if the intraocular pressure is temporarily raised to a high level. Following the gas injection, the patient’s head is immediately positioned so that the gas bubble is opposed directly to the break. If the retinal detachment does not involve the macula but threatens it, the steamroller technique should be seriously considered to prevent subretinal fluid displacement into the macula. In the steamroller technique, the patient’s head is initially turned to a face-down position, as depicted in the first image below. Over 10-15 minutes, the position is gradually changed until the retinal break is uppermost, as depicted in the second image below, causing the bubble to roll toward the retinal break, pushing the subretinal fluid away from the macula and back into the vitreous cavity through the retinal break, flattening the retina. See the third image below. Steamroller technique. A patient with a superotemporal break in the right eye. The patient's head is initially turned to a face-down position. Steamroller technique. A patient with a superotemporal break in the right eye. 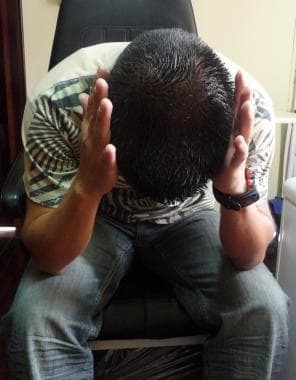 Over 10-15 minutes, the position is gradually changed until the retinal break is uppermost. Steamroller technique. A patient with a superotemporal break in the right eye. Final head position. One of the theoretical disadvantages of the steamroller technique is the potential for proliferative vitreoretinopathy development. Since the subretinal fluid is displaced back into the vitreous cavity during this maneuver, retinal pigment epithelium (RPE) cells within the subretinal fluid might gain access to the retinal surface. 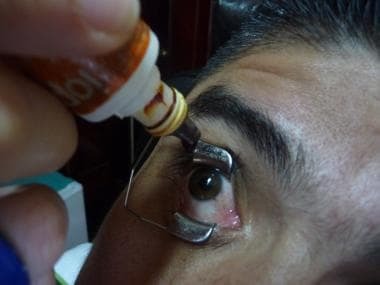 After dilating the pupil, 3-5 drops of topical anesthesia are instilled in the eye. Anesthetic is injected subconjunctivally in the quadrant with the retinal break. A lid speculum is inserted, and 3 drops of 5% povidone-iodine solution are instilled and left in place for 5 minutes. Aqueous humor (0.3-0.5 mL) is removed from the anterior chamber via a paracentesis to lower the intraocular pressure. See the images below. Aqueous humor (0.3 to 0.5 mL) is removed from the anterior chamber via a paracentesis to lower the intraocular pressure. Either 0.3 mL of C3F8 or 0.5 mL of SF6 is filtered through a Millipore filter (0.22 µm) into a 1-mL syringe with a short (half inch) 27- or 30-gauge needle. After inserting half of the needle into the vitreous cavity, the needle should be partially withdrawn until only 1 mm is still in the eye. A slow injection of gas through the shallowly inserted needle allows continued gas placement into the same single enlarging gas bubble, avoiding the formation of “fish-egg” bubbles. The gas should also be injected away from any large retinal break to reduce the risk of subretinal gas migration. See the image below. After inserting half of the needle into the vitreous cavity, withdraw needle until only 1 mm is in the eye. Inject gas slowly through the shallowly inserted needle for continued gas placement into the same single enlarging gas bubble. Inject gas away from any large retinal break to reduce the risk of subretinal gas migration. If multiple bubbles are present, the patient should remain in a position to keep the small bubbles away from a large retinal break for 24 hours. The “fish-egg” bubbles usually coalesce over 12-24 hours. As the needle is withdrawn, a cotton-tipped applicator is placed over the perforation site, and the patient’s head is rotated to prevent gas from escaping through the puncture site. Afterward, the surgeon must perform indirect ophthalmoscopy to confirm the placement of the gas into the vitreous cavity and to assess the perfusion of the central retinal artery. If the artery remains nonpatent and nonpulsatile 10 minutes after gas injection, a paracentesis is repeated to reduce the risk of ischemic retinal damage. Elevated intraocular pressure is usually not a significant problem after the intraocular injection of less than 0.5 mL of gas. Immediate elevation of intraocular pressure to levels between 30 and 50 mm Hg is common, but pressure returns to normal after 90 minutes. In certain situations, cryopexy can be omitted and laser may be applied a few days later when the break has flattened. Patient selection is key to success. 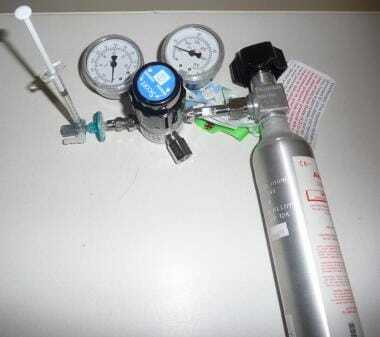 Perform paracentesis prior to gas injection. Avoid performing pneumatic retinopexy in eyes in which the retinal periphery is not adequately visualized. Insert the needle into the vitreous cavity and then retract it so that the tip is just barely in the vitreous cavity. This will allow for a shallow injection. Then, inject slowly. This will reduce the risk of “fish egg” bubbles. If “fish egg” bubbles develop, try coalescing them into a single bubble by striking the globe with a finger or a cotton tip applicator. If multiple breaks are present over an area equivalent to several clock hours, treat the most superior breaks first. Consider prophylactic 360° peripheral laser barricade to reduce the risk of new and/or missed retinal breaks. Have a low threshold and high ability to recognize when the procedure has failed and when to move on to scleral buckling and/or vitrectomy. New or missed breaks may develop in any quadrant; however, 76% are located in the superior 8 clock hours. The progressive vitreoretinal separation and vitreous traction induce the formation of new breaks and the reaccumulation of subretinal fluid. New breaks that are located in the superior quadrants and are not widely separated (more than 1 or 2 clock hours apart) may be successfully treated with an additional gas injection followed by cryotherapy and/or laser retinopexy. [4, 22] Likewise, the formation of a new break in the inferior quadrants is usually an indication for scleral buckling and/or vitrectomy. Cataract development and progression is very uncommon after pneumatic retinopexy. Delayed subretinal fluid absorption is uncommon and is characterized by long-term persistence of loculated pockets of low-lying subretinal fluid. When involving the macula, these pockets of fluid cause prolonged postoperative visual symptoms such as decreased visual acuity and metamorphopsia. The presence of subretinal fluid can persist for several months. No specific management is required, but close follow-up is essential. [6, 10, 27] See the images below. Residual subretinal fluid. This patient underwent pneumatic retinopexy and the retina appeared to have flattened. However, the patient reported metamorphopsia and a central scotoma. 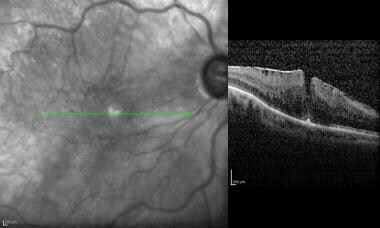 The optical coherence tomograph shows residual submacular fluid. This submacular fluid persisted for 9 months and then was reabsorbed. Cystoid macular edema. A pseudophakic patient underwent pneumatic retinopexy. The retina was attached, but the visual acuity remained low. An optical coherence tomograph reveals cystoid macular edema. The patient was treated with topical nepafenac for 2 months and the cystoid macular edema resolved with a concomitant improvement in visual acuity. Gas “fish-egg” bubbles may migrate through retinal breaks into the subretinal space, particularly in the presence of large breaks. Hilton and Tornambe (1991) found that any eye retinal breaks larger than 1 clock hour are associated with an increased risk for such bubbles. 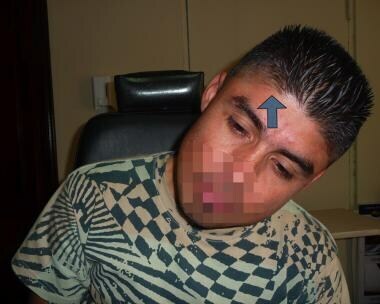 In these cases, the patient’s head should be positioned in such a way that the bubbles migrate away from the tear. It usually takes 24 hours for the bubbles to coalesce. The incidence of endophthalmitis as a complication of pneumatic retinopexy is very low. Tornambe and Hilton (1989)  reported one case of staphylococcal endophthalmitis among the 103 eyes that underwent pneumatic retinopexy. Epimacular membrane. Following pneumatic retinopexy, the patient developed an epiretinal membrane, which is documented in the clinical picture and the optical coherence tomograph. The rate of PVR varies depending on the clinical series. Chen et al (1988)  reported a 9.8% incidence in a prospective series of 51 eyes that underwent pneumatic retinopexy. Tornambe (1997)  also noted a 9.6% incidence of PVR with no difference in the incidence of PVR between those eyes that underwent cryotherapy versus laser. Because of the requirement of a consistent head tilt for a prolonged period, pneumatic retinopexy may lead to various musculoskeletal and neurological injuries, especially among elderly patients. Cervical spine, neck muscles, and lower back problems and ulnar nerve injury may occur. These are minor and are typically temporary. Full-thickness corneal wounds never regain their original tensile strength. Immediately following an intravitreal gas injection, the intraocular pressure rises suddenly up to 180 mm Hg,  which is enough to stress and rupture the corneal scar. Wound dehiscence has been reported to occur during pneumatic retinopexy in pseudophakic eyes that underwent clear corneal incisions and in an eye with a prior penetrating keratoplasty. [36, 37] In these cases, a slower injection of a smaller volume of gas should be strongly considered. Dominguez A. Cirugia precoz y ambulatoria del desprendimiento de retina. Arch Soc Esp Oftalmol. 1985. 48:47-54. Hilton GF, Grizzard WS. Pneumatic retinopexy. A two-step outpatient operation without conjunctival incision. Ophthalmology. 1986 May. 93(5):626-41. [Medline]. Han DP, Mohsin NC, Guse CE, Hartz A, Tarkanian CN. Comparison of pneumatic retinopexy and scleral buckling in the management of primary rhegmatogenous retinal detachment. Southern Wisconsin Pneumatic Retinopexy Study Group. Am J Ophthalmol. 1998 Nov. 126(5):658-68. [Medline]. Chan CK, Lin SG, Nuthi AS, Salib DM. Pneumatic retinopexy for the repair of retinal detachments: a comprehensive review (1986-2007). Surv Ophthalmol. 2008 Sep-Oct. 53(5):443-78. [Medline]. Tornambe PE. Pneumatic retinopexy. Surv Ophthalmol. 1988 Jan-Feb. 32(4):270-81. [Medline]. Desatnik H, Alhalel A, Treister G, Moisseiev J. Management of persistent loculated subretinal fluid after pneumatic retinopexy. Br J Ophthalmol. 2001 Feb. 85(2):189-92. [Medline]. Ambler JS, Zegarra H, Meyers SM. Chronic macular detachment following pneumatic retinopexy. Retina. 1990. 10(2):125-30. [Medline]. 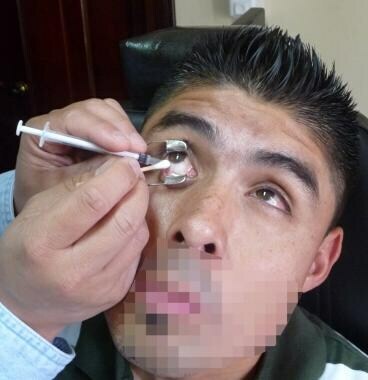 Zaidi AA, Alvarado R, Irvine A. Pneumatic retinopexy: success rate and complications. Br J Ophthalmol. 2006 Apr. 90(4):427-8. [Medline]. Holz ER, Mieler WF. View 3: The case for pneumatic retinopexy. Br J Ophthalmol. 2003 Jun. 87(6):787-9. [Medline]. Hilton GF, Tornambe PE. Pneumatic retinopexy. An analysis of intraoperative and postoperative complications. The Retinal Detachment Study Group. Retina. 1991. 11(3):285-94. [Medline]. Tornambe PE, Hilton GF. Pneumatic retinopexy. A multicenter randomized controlled clinical trial comparing pneumatic retinopexy with scleral buckling. The Retinal Detachment Study Group. Ophthalmology. 1989 Jun. 96(6):772-83; discussion 784. [Medline]. Goldman DR, Shah CP, Heier JS. Expanded criteria for pneumatic retinopexy and potential cost savings. Ophthalmology. 2014 Jan. 121(1):318-26. [Medline]. Davis MJ, Mudvari SS, Shott S, Rezaei KA. Clinical characteristics affecting the outcome of pneumatic retinopexy. Arch Ophthalmol. 2011 Feb. 129(2):163-6. [Medline]. Rootman DB, Luu S, M Conti S, Mandell M, Devenyi R, Lam WC. Predictors of treatment failure for pneumatic retinopexy. Can J Ophthalmol. 2013 Dec. 48(6):549-52. [Medline]. Petrushkin HJ, Elgohary MA, Sullivan PM. RESCUE PNEUMATIC RETINOPEXY IN PATIENTS WITH FAILED PRIMARY RETINAL DETACHMENT SURGERY. Retina. 2015 Sep. 35 (9):1851-9. [Medline]. Waterhouse WJ, Bradshaw DJ, O'Boyle JE. Pneumatic retinopexy with air. Retina. 1993. 13(3):270-1. [Medline]. Chang TS, Pelzek CD, Nguyen RL, Purohit SS, Scott GR, Hay D. Inverted pneumatic retinopexy: a method of treating retinal detachments associated with inferior retinal breaks. Ophthalmology. 2003 Mar. 110(3):589-94. [Medline]. Yanyali A, Horozoglu F, Bayrak YI, Celik E, Nohutcu AF. Steamroller versus basic technique in pneumatic retinopexy for primary rhegmatogenous retinal detachment. Retina. 2007 Jan. 27(1):74-82. [Medline]. Bourla DH, Gupta A, Hubschman JP, Bourla N, Yu F, Schwartz SD. The slower the better: on the instability of gas jets in a model of pneumatic retinopexy. Invest Ophthalmol Vis Sci. 2007 Jun. 48(6):2734-7. [Medline]. Tornambe PE. Pneumatic retinopexy: the evolution of case selection and surgical technique. A twelve-year study of 302 eyes. Trans Am Ophthalmol Soc. 1997. 95:551-78. [Medline]. Mudvari SS, Ravage ZB, Rezaei KA. 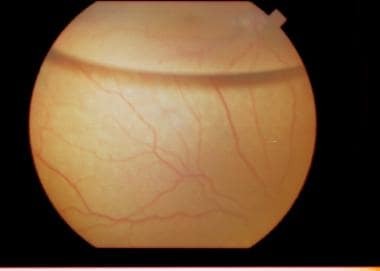 Retinal detachment after primary pneumatic retinopexy. Retina. 2009 Nov-Dec. 29(10):1474-8. [Medline]. Chen JC, Robertson JE, Coonan P, Blodi CF, Klein ML, Watzke RC. Results and complications of pneumatic retinopexy. Ophthalmology. 1988 May. 95(5):601-6. [Medline]. Poliner LS, Grand MG, Schoch LH, Olk RJ, Johnston GP, Okun E. New retinal detachment after pneumatic retinopexy. Ophthalmology. 1987 Apr. 94(4):315-8. [Medline]. Grizzard WS, Hilton GF, Hammer ME, Taren D, Brinton DA. Pneumatic retinopexy failures. Cause, prevention, timing, and management. Ophthalmology. 1995 Jun. 102(6):929-36. [Medline]. Koch F, Spitznas M, Böker T, Mougharbel M, Ohlhorst D, Hockwin O. [Development of lens opacities in a period of 6 months after pneumatic retinopexy]. Fortschr Ophthalmol. 1991. 88(3):216-8. [Medline]. Taher RM, Haimovici R. Anterior chamber gas entrapment after phakic pneumatic retinopexy. Retina. 2001. 21(6):681-2. [Medline]. Proulx AA, Sheidow TG. Development of macular hole in the early postoperative period following pneumatic retinopexy. Ophthalmic Surg Lasers Imaging. 2006 Nov-Dec. 37(6):481-3. [Medline]. Avins LR, Krummenacher TR. Macular holes after pneumatic retinopexy. Case reports. Arch Ophthalmol. 1988 Jun. 106(6):724-5. [Medline]. Tunc M, Lahey JM, Kearney JJ, Lewis JM, Francis R. Cystoid macular oedema following pneumatic retinopexy vs scleral buckling. Eye (Lond). 2007 Jun. 21(6):831-4. [Medline]. Batman C, Cekiç O. Pneumatic retinopexy in the treatment of recurrent retinal detachment. Ophthalmology. 1998 Oct. 105(10):1788-9. [Medline]. Jabaly-Habib HY, Fineberg EM, Tornambe PE, Lang YZ, Garzozi HJ. Prolonged pain following unintentional injection of gas into the suprachoroidal space during pneumatic retinopexy. Retina. 2003 Oct. 23(5):722-3. [Medline]. Chen SN, Hwang JF. Treatment of rhegmatogenous retinal detachment in teenagers by pneumatic retinopexy technique. Am J Ophthalmol. 2007 Feb. 143(2):217-221. [Medline]. Gasset AR, Dohlman CH. The tensile strength of corneal wounds. Arch Ophthalmol. 1968 May. 79(5):595-602. [Medline]. Abe T, Nakajima A, Nakamura H, Ishikawa M, Sakuragi S. Intraocular pressure during pneumatic retinopexy. Ophthalmic Surg Lasers. 1998 May. 29(5):391-6. [Medline]. Wu L, Flikier D. Corneal graft dehiscence during pneumatic retinopexy. Retina. 2006 Jul-Aug. 26(6):707. [Medline]. Jun AS, Pieramici DJ, Bridges WZ. Clear corneal cataract wound dehiscence during pneumatic retinopexy. Arch Ophthalmol. 2000 Jun. 118(6):847-8. [Medline].